Today was our last day in Paris. That is both a good thing and a sad thing. Certainly, I think we are ready to be home. We have been here long enough that the first thing on our mind when we wake up is no longer what new thing are we going to do today. On the other hand, it is always a little sad to say goodbye to something you've grown accustomed to and say goodbye to the few casual friends we have made here. 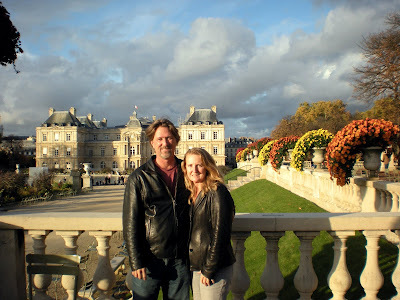 The first thing we did today was revisit Luxembourg Gardens. The leaves on the trees are now mostly gone and new flowers for the winter have been planted. It's still an amazing place to visit and, despite the chilly sub-50 degree temperatures, there were still people bundled up sitting around the grassy areas. We then made one final walk down Blvd St Michel to visit Notre Dame. We wanted to visit the crypt but it was closed on Mondays (!) so we just went inside. We did get to visit the Treasury of Notre Dame which contains some ancient relics. That was pretty cool. Amanda then did some shopping and returned home while I finally made it to the Montparnasse Tower to go to the top for my long awaited panoramic view of Paris from the 59th floor. Fortunately, the weather this morning was perfectly clear despite the rain forecast. By the time I got to the top of the tower, it had become partly cloudy but the visibility was still good. It was windy and cold at the top but the view was great. The towers sits in the south side of Paris so the views north, east, and west are great. There isn't much to see to the south. I created a panoramic image stitched together from 6 individual pictures. It's not a very clean stitch but you still get the idea. The dark sections in the sky are not rain or storms, but where the pictures were stitched together because the left edge of my images was darker. You will need to click on the picture to enlarge (it's very large). I will post a separate article with more pictures later. We returned to the house for the remainder of the afternoon so I could get some work done and Amanda could begin packing. At 7p, Cedric the Manager showed up to refund our deposit and reimburse for the plumber (I talked about my nightmare plumber experience earlier.) Fortunately that went smoothly. We also learned that the owner of the apartment, Eva Darlan, is a French Actress (you can Google her) but she just sold the apartment for 500,000 Euros which apparently is a bargain. Apartments in this part of Paris sell for 10,000 Euros per square meter! That works out to about $1300/sq ft! Our apartment is 90 sq meters (about 1000 sq ft) which means it normally would sell for 900,000 Euros but the new owner got it for 500,000. 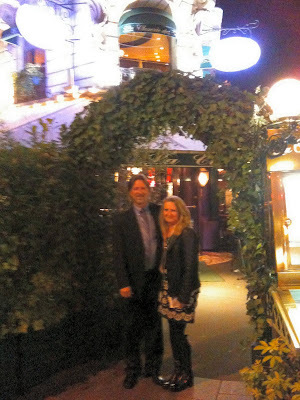 Opened in 1847, the Closerie was a social and culinary magnet for the avant-garde. The famous people who have sat in the "Pleasure Garden of the Lilacs" include Gertrude Stein and Alice B. Toklas, Ingres, Henry James, Chateaubriand, Picasso, Hemingway, Apollinaire, Lenin and Trotsky (at the chessboard), and Whistler. The food is pricey but quite good. 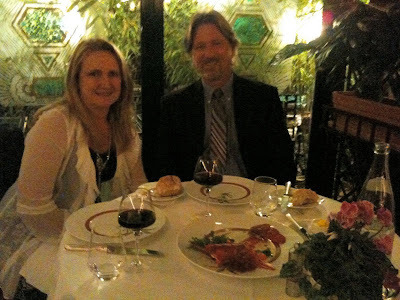 We shared a lobster salad appetizer and both ordered the scallops on risotto. I am hoping to stay up all night (it's already 12:45a here) and catch the car to the airport at 7a for the 10a flight and then sleep on the plane. I can use the time to post some more articles (I am way behind) while watching the 5th game of the World Series and Monday Night Football. Don't know if I will make it but there are a couple Red Bulls in the refrigerator!